The Washington Capitals continued to light the league on fire in Week Two of the regular season, but it wasn't the trigger man that got the honours for being the best player in the hockey pool, it was the setup guy, who got the job done. Nicklas Backstrom was the top dog in the hockey pool in Week Two, picking up 9 points, leading all players outright, no tie-breakers necessary. This is Backstrom's sixth Player of the Week nod on the Newsletter all-time and his third one in the last season and two weeks of this early campaign. There is little doubting his recent value, as his numbers have been quite staggering lately. Backstrom and the Capitals played four games in the week and he had points in all four games, putting together a nice 5-game points streak already. He started the week with a goal and a couple assists against Tampa on Monday, had an assist on Wednesday against the Penguins, popped a goal and 3 assists against the Devils on Friday and capped it all off with another goal against Philadelphia on Saturday. Scott B. saw a pretty good bounce back from a rough start in Week One, thanks in large part to having the Player of the Week, making gains from 24th to 14th in the standings. The race for the Mover & Shaker was a good one in Week Two, as there were five teams that eclipsed the 30-point mark in the second week of the season and there was another 11 teams that finished at 25 or more points in the week as well, suggesting that there was a lot going on in the first full week of the season. Thanks to a late push on Sunday night, Clayton's team finished atop of the weekly standings, finishing Week Two with 34 points. 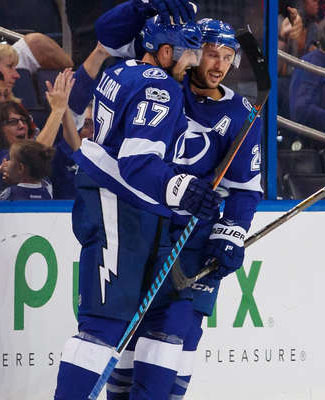 Clayton's team was led by Alex Killorn in Tampa Bay, who finished with 6 points, while Anze Kopitar and Drew Doughty in Los Angeles each had 5 points and Dylan Larkin of the Red Wings had 4 points. Neither one of Clayton's goalies had a point in the week and he only had one skater without a point in the week as well. The forwards have been the key position to start the season for Clayton's team, despite him picking goalies with his first two selections, a pair of picks that had done nothing for him in this week. Clayton's forwards currently rank tied for 3rd in the pool with 37 points and his defense, which didn't score a point in Week One, finished with 9 points in the week and is currently ranked tied for 11th through Week Two. Getting a healthy start to the season is also key, with Clayton's team being one of eight teams in the pool to have 60 or more skater games played and one of ten teams to have over 400 minutes played by their goalies as well. If you can get a team that can stay relatively healthy, it should go a long ways to a successful campaign. Not being healthy is one of the main reasons why Brenda & Seward's team has started the season off with back-to-back Basement Dweller nods in the pool. With only 10 points in Week Two, they have just passed the halfway mark of Jeremy's opening week totals and they are falling behind quite rapidly at this point. Six players on their roster have yet to register a point in this season, while three players have still yet to play a game. Alexander Wennberg of the Blue Jackets was tops for their team, finishing the week with 3 points. Currently, the duo rank last in skater games played, with only 43 games to their credit, well behind the leader, Brian, who sits at 65 games. Things are starting to look up, as Erik Karlsson has resumed full contact and should be back in the Ottawa lineup this week, while Alex Steen could be back for the Blues on Wednesday and Patrice Bergeron is penciled in to returning to the Bruins lineup on Thursday. If these three can get back into their respective lineups, things could turn around for the duo. Jeremy's team wasn't quite as dominant in Week Two as it was in the opening week, but it still was able to put some ground in between his side and 2nd place, Brian, as the lead has already extended out to 16 points. Brian, who sits at 53 points, isn't safe at his position at all, as 6 points is all that separates his 2nd place team to Stacey C.'s 11th place team and that's short work on a bad week for a team to make up. Chris kept his spot in 3rd place in the week and he'll open the week only a point back of Brian and only 2 points up on Clayton, Cam and Derek B.. The goalie survivor pool saw three teams drop out during Week Two, as Clayton, Troy and Wes all couldn't manage a win and therefore, they have already been dropped from this mini-game. This now leaves 15 teams in the running for their money back, still a very good participation level, heading into Week Three. The team on the bubble heading into this week belongs to Scott B., who has lost his number one goalie, which you can read about below, which leaves him with only two projected possible starts and if there are only two starts for one team and you have the backup, like Scott does in this situation, it seems unlikely that he'll make it out of Week Three. I've got the audit working properly now, so the plus/minus pool will be updated regularly with the Newsletter, which is excellent news! There were three teams tied for the lead after Week One and one of those teams really took the ball and ran with it in Week Two and that was Grant's team, which led the way in the week with a +14 rating and he now has a team with an overall rating of +25, already 13 points better than Steve in 2nd place. Stacey M.'s team has not been doing so good on the defensive side of the puck, collecting a -15 rating in Week Two, dropping her total down to a pool-worst, -20. The initial scoring spree in the NHL has seemed to have quieted down a little bit, as the eventual scoring downturn came and we dropped down from 14.9 collected points per NHL game, down to 13.1 points, staying relatively consistent in games played and minutes played by both our skaters and our goalies. This week, the schedule is a bit light, with only 43 games on the docket, Monday to Sunday, which will keep the overall point levels down, especially if you have a lot of Anaheim Ducks, who only play once this week... on Friday. Detroit, Tampa Bay and Vancouver all have four games this week, but it's pretty light throughout the league, so be mindful of that, when you see your team doesn't have enough points. Buffalo Sabres forward Kyle Okposo was under the weather on Saturday night, missing out on the game against the Kings in Los Angeles and was also not in the lineup for the game against the Ducks on Sunday night too. He's currently listed as day-to-day at the moment and he should be back in the lineup again soon. Wes' team is still suffering a little bit in his first two weeks of the season, down in 24th, but his team is only 17 points behind the money, so there's no room for panic just yet. Okposo has yet to register a point in six games and is a whopping -6 in the plus/minus pool, which isn't helping either. Flames forward Micheal Ferland was unable to go against the Canucks on Saturday night, the team citing a lower-body injury holding him out for now. He's currently listed as day-to-day and could be back in the lineup before too long. The Flames play next on Thursday night with the Hurricanes in town, so he'll get a good break to rest up. Derek B. has had a pretty good week, as he is hovering around the money spots and is in striking distance of 2nd place. Ferland has a goal in five games for Derek's team, but is a -2 in the plus/minus department, as his team is tied for 17th in this mini-game. Dennis Seidenberg of the Islanders has only made one appearance for the Islanders in the early part of this regular season, as he has been a regular healthy scratch for the club in the games he hasn't played, including Saturday night against the Sharks and Sunday night in Los Angeles. The German rearguard had a decent 2017 season, but has yet to make his mark in the 2018 season, thanks to a deep blueline, to which he hasn't been able to crack yet. For Neil, this hasn't helped him climb out of the bottom half of the standings, but his team isn't too far off yet. It sounds like Erik Karlsson is on his way back to the Senators lineup this coming week, which means that youngster Thomas Chabot is on his way back down to the AHL for some more seasoning, by playing a lot more minutes than he would with the big club. Chabot was good in Karlsson's absence, picking up a couple helpers in three games. I don't think it will be very long until we see Chabot up again, as he should be the go-to guy, if and when more injuries hit. That's got to be disappointing for Chris, as his team has looked pretty sharp through the first couple weeks, in the conversation for the money early on. Losing a man to the minors won't help, but he won't be too far away, if necessary. The Vancouver Canucks lost the services of veteran forward Loui Eriksson to a knee injury against the Flames on Saturday night, leaving the game early on in the 1st period, not to return. There hasn't been any updates, as of yet, but it seems doubtful that he will be ready to go on Tuesday, when they visit the Senators. He'll be listed as day-to-day, unless the Canucks say otherwise. More bad news for Tony's team, which just can't seem to catch a break. Tony's team has been pretty good in Week Two, despite his bad week for injuries, picking up 27 points, but still down in the bottom half of the standings. His team will really have to fight through these injuries, if it is going to keep the pace. The Golden Knights took a huge hit to their lineup ahead of the Sunday night game yesterday, as they announced that Marc-Andre Fleury and Jonathan Marchessault were both placed on the Injured Reserve and neither have a real timetable for a return. Fleury is listed as out indefinitely with a concussion, which he reportedly suffered on Friday night against the Red Wings, while Marchessault is dealing with a lower-body injury, also suffered against the Red Wings and he'll likely be reevaluated once his week on the IR is up on Friday. Really bad news for Scott B., as his goalie was certainly keeping him afloat in Week Two, as the Golden Knights have been outperforming the early season expectations put upon them. Scott's team saw a big recovery after a poor opening week and Fleury was a big help there, so it could be a big loss. For Benson, Marchessault has yet to find his stride in Vegas, but his team is still in good shape with a cold (and now injured) Vegas forward. We're waiting to hear what the news is for Winnipeg Jets forward Mathieu Perreault, who left the game against the Hurricanes on Saturday night with a lower-body injury. We'll probably see some more updates to the injury situation in Winnipeg today or tomorrow, as they don't play again until Tuesday night, at home against the Blue Jackets. Grant's team didn't have a great Week Two and the injury was not the icing he wanted on his cake. If the loss of Perreault is significant, he would certainly lose a significant scoring threat in his team, as Perreault has 3 points in five games already this season. One more injury note from Sunday night, as the Boston Bruins lost the services of forward Ryan Spooner to a lower-body injury against the Golden Knights. Spooner hasn't been overly productive on an underachieving Bruins side early on this season, having only 1 point in five games, and his status will likely be updated in the next day or so, waiting on the reports for his injury. Wes hasn't been overly lucky in the first couple weeks either, having some slight injury problems, albeit minor problems, to start the year. His team is tied for 13th in skater games played, not quite yet moving past the 60 games mark.